Celebrations…by Diana would be honored to have the opportunity to be your premiere Wedding Coordinators. Celebrations by Diana services the San Diego, Orange County, Inland Empire and Temecula California areas. 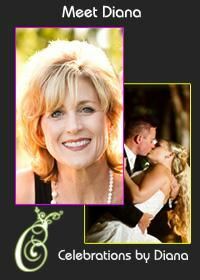 We have specialized in Temecula Wine Country Weddings and Events for over 15 years. We offer a variety of wedding packages, including location tours, month of event, Mini preplans, and full service wedding packages. See our website for complete details on building your perfect dream wedding.